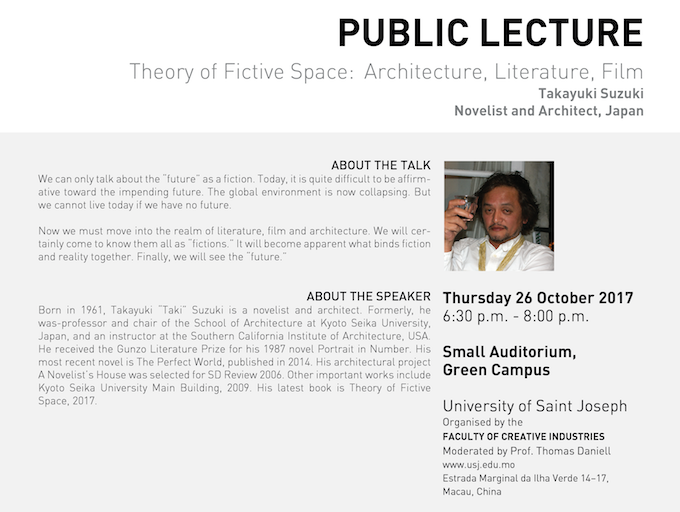 Born in 1961, Takayuki “Taki” Suzuki is a novelist and architect. Formerly, he was-professor and chair of the School of Architecture at Kyoto Seika University, Japan, and an instructor at the Southern California Institute of Architecture, USA. He received the Gunzo Literature Prize for his 1987 novel Portrait in Number. His most recent novel is The Perfect World, published in 2014. His architectural project A Novelist’s House was selected for SD Review 2006. Other important works include Kyoto Seika University Main Building, 2009. His latest book is Theory of Fictive Space, 2017. We can only talk about the “future” as a fiction. Today, it is quite difficult to be affirmative toward the impending future. The global environment is now collapsing. But we cannot live today if we have no future.